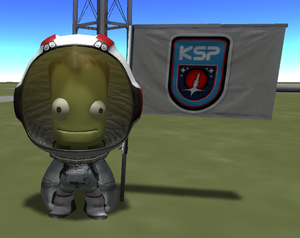 09, Blorbs, Bullseye, Capsule, Circles, Default, Hexagon, Hexagon Circles, Kerbal 1, Kerbal 2, Kerbin, Kerbin-Mun Flag, Line, Minimalistic, Orbit, Orbs, Retro, Rings, Rocket Science, Satellite, Spheres, Squad Logo 1, Squad Logo 2, Stripes, Trees, and Trippy. All default flags are located in GameData/Squad/Flags although other mods can add their own images in their own directory (GameData/<mod>/Flags). New flags can be added and used if it is placed in this or similar folder. A flag filename can have spaces; underscores are not required to separate words. Some of the images are based on posters from the 2009 International Year of Astronomy, while one is based Signalnoise's unofficial mission patches and another flags are based on animator and director David O'Reilly. The manufacturer's logos are also available as flags, starting from version 0.24. A flag is a PNG image with a width of 256 pixels and a height of 160 pixels. While the image format does allow for partial and full transparency, this will not show up in the game; rather, partial transparency will appear as a solid color and full transparency will appear white. As a result, all flags must be the standard shape and for example, the Nepalese flag or the squared flag of Switzerland could not be used in the game without adding white space. The Minimalist flag, while it can be selected, appears as the default flag when planted. Some people say that the minimalist flag is overlaid onto non-default flags for realism, and while all non-default flags do bear wrinkles in the same pattern, changing this file won't change the appearance of the other flags. 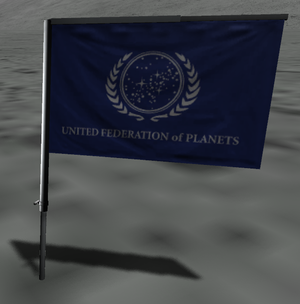 Most likely the game holds a similar image to this flag somewhere internally with integrated alpha channel to combine both flags. Oddly enough, the default flag does not have this overlay; rather, it is already part of the flag's .png image. This suggests that a flag named default.png will be left untouched; as a result, players can exploit this in order to have solid colors. Kerlington Model Rockets and Paper Planes Inc. This page was last edited on 27 May 2017, at 22:30.